Singers. Songwriters. Musicians. YouTubers. Celebrities. Any way you want to call them. 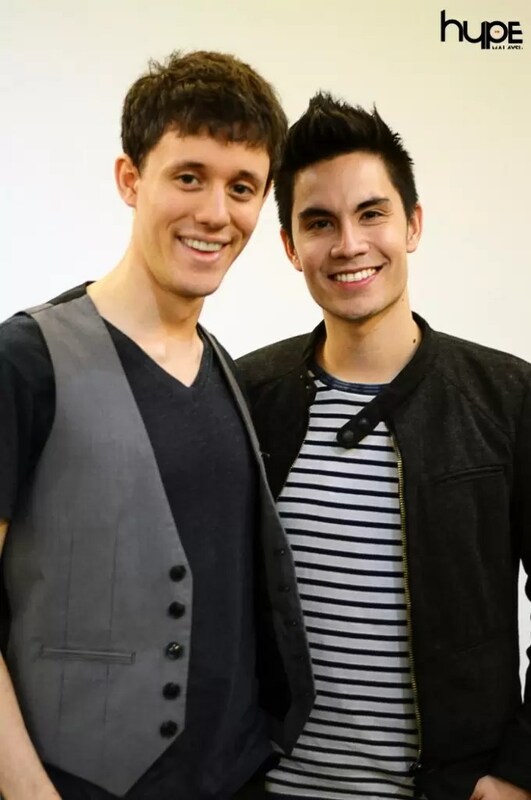 But for good reasons, Sam Tsui and Kurt Schneider pull at their fans’ heartstrings whenever they “perform” via their YouTube videos. And that’s just on video. Q: Hi guys! How are you liking Malaysia so far? Kurt: It’s awesome, it’s our first time here. Kurt: I won’t say that I’m loving the heat but..
Sam: I’m loving the air conditioning! Q: Now, we know you’ve previously said that you were the really awkward kids in school but..do you remember the time when you first met? Sam: Kurt is a really amazing Math genius, essentially. He would never say that but it’s true. He was the kid in middle school who’d be taking Math classes at the high school. So, before I really knew him, I knew him as that really smart Math kid. That was my first impression – that he was a crazily smart kid. Kurt: The first time I felt like I knew Sam was..we were in the middle school same choir and in the same bus route together. The bus would pick me up at then Sam up from the very next stop. Sam was always the kid in the middle school choir who was really, really good. Sam: And really loud! Obnoxiously so. Kurt: But for good reasons. Q: Do you remember your first conversation with each other? Sam: It was probably on the bus. We had a little group on this bus..of kids who sat in the front. In retrospect, we were probably like..the losers but we didn’t really know that at that time. We would all hang out and talk about..who knows? Kurt: Our first conversation was probably about our bus driver, Gunther, who was a very funny character. Sam: Yeah, he seemed really angry all the time so we’d talk about him and try to talk to him and make fun of him! Q: Gunther sounds like that dude in FRIENDS..the one who works at Central Perk. Was he like that, too? Sam: Oh yeah! (laughs) Exactly! Kurt: He didn’t like any of us or any of the other kids either. Sam: Hopefully Gunther is not like a big fan now or reading this interview (laughs). Q: What made you post up that first ever video on YouTube? Kurt: We actually started posting up videos in college when we were pretty much just making music out of our bedrooms. YouTube was just starting and it was just getting big. We saw some stuff on there but it was mostly videos of people’s pets or simple videos of someone playing the piano or a guitar. We loved music so we thought we’d be able to do great stuff that we love so we tried posting up videos on YouTube. Q: Your fellow YouTuber, David Choi, was just here a few months ago and we mentioned you guys, and he said you guys were good at what you do. So, on that note, which YouTube musicians do you think are good at what they do or that you look up to? Q: A few days ago, you posted up the airport song. Did you guys plan that way before or was it done on the fly? Kurt: It was written on the way to the airport in..probably less than 20 minutes. We just started humming a melody and wrote down a few lines..
Sam: I think the people at the airport thought we were crazy but no..it was very much on the fly. We love jamming out and making up weird little songs. It seemed like a cool way to promote our tour and to pass time as well. This might be our new tradition – airport songs. Kurt: Maybe we’ll do one at KLIA but we can’t start it until we get to the airport. It has to..all be written and recorded at the airport. Q: Last one for the road – how do you YouTube musicians like yourselves put up with keyboards warriors and haters? Kurt: You have to believe in yourself. If you love what you’re doing and you believe in it, then you just have to go with that. We’re fortunate that we now have so many fans that if somebody ever writes a negative comment, it’s down voted before we can ever see it. If you’re just starting out, you just gotta believe in yourself. Sam: I think that the thing that counteracts that (times ten) is a positive comment. That..hopefully can give you the strength to ignore however many hate comments you get because something you did made someone else happy. And that’s why we keep doing what we do. Thanks for the chat, you guys! And thank you for being so sweet. Special thanks also to our friends from Livescape Asia for making this interview happen. Previous articleLet’s Go To Diagon Alley – For Real!